Brief and to the Point: So, What Is Sushi Exactly? To explore some of the different kinds of sushi – let’s get you acquainted with a few favorites. Makizushi is served inside dried and pressed sheets of seaweed called nori. Nigirizushi uses hand-formed chunks of rice as toppings. Fried tofu pouches filled with toppings are called inarizushi. A bowl of sushi rice with various added ingredients on top is known as chirashi-zushi. Commonly selected fish found in sushi includes tuna, yellowtail, snapper, salmon, mackerel, and eel. Seafood (like octopus, shrimp, squid, clam, scallops, and crab are also popular ingredients. With sushi, don’t expect to find the typical ‘vegetables’ you are used to. Pickled radish, fermented soybeans, avocado (in California rolls), cucumber, tofu, gourds, and sweet corn (mixed with mayonnaise) are common. Lightly fried red meats sometimes make an appearance like sausage, ham, or beef. Do you have what it takes to test out sweetened omelets (tamagoyaki) and raw quail eggs found in some sushi recipes? When preparing sushi, a chef relies on items, such as a kitchen cloth, rice barrel, bamboo rolling mat, kitchen knives, cooking chopsticks, and wooden rice paddle. After the culinary masterpiece is ready for you to devour, you can either use your hands or chopsticks. A range of sushi selections are also meant for the fingers, as the rice is packed loosely and will break apart if eaten in another manner. With an assortment of sushi decorating your plate – tradition suggests to begin with white-fleshed (mild tasting) items and then move onto darker (or stronger tasting) selections. Condiments also become a part of the preparation and eating of sushi. However, adding too much wasabi or soy sauce can lessen spiciness. Sometimes, the taste of the fish is lost when too much of a good thing is used. Additionally, contrary to popular belief – pass on the sake – as it can diminish your overall experience with sushi. What’s So Good About Sushi? Nowadays, people are searching for healthy foods that provide a decent level of nutritional benefit. With sushi, you can sleep well – knowing that raw fish and rice are naturally low-fat food items. 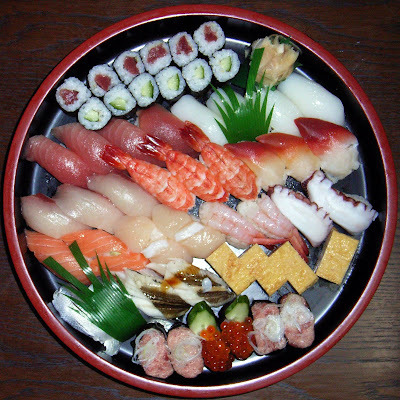 Sushi is also high in protein when you eat fish, tofu, seafood, and egg selections. The rice and vegetables deliver a healthy dose of carbohydrates. This tasty Japanese treat is also full of valuable vitamins and minerals. However, just be careful of some of the western-style rolls, which can sometimes stray a bit in calories. Don’t let the threat of bad sushi stop you from discovering this distinct culinary wonder – all you have to do is know the warning signs upon entering a restaurant. Fish and other seafood on display should never look dry. Never eat at a restaurant that advertises an ‘all you can eat sushi’ meal for a set price. An eatery that serves large pieces of fish may not provide a high enough quality of food, as smaller pieces of fish supply the best flavor. Another warning sign centers on sushi rice that lacks flavor. Also – a restaurant that doesn’t display their fish or seafood at the sushi bar is up to something ‘fishy’ if you know what I mean.